Easements are either registered on the land title or implied by underground utilities. When developing your property, ensure that both registered and implied easements are kept clear, and that there is an area leading up to each easement from which it can be accessed. Email Asset Management for more information about how easements are located. If you are considering works that impact an easement submit a build over easement enquiry. To locate registered easements on your property, order a copy of the land title from Landata. The title usually also includes a land surveyors’ map with easement locations. They are often along the property boundary, but may be anywhere on the property. The diagram shows how a land title may present an easement. The area behind the dotted line is the easement 'E1'. The easement runs through subdivisions 1 and 2. 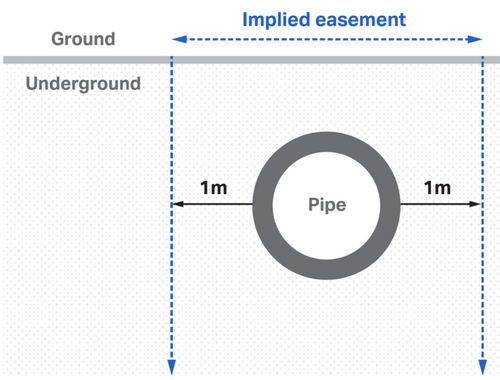 An implied easement is the area over and 1m to either side of an underground utility. Implied easements aren’t listed on the land title. Contact Dial Before You Dig and request the location of any underground stormwater or sewerage pipes on your property. On your land, identify the actual location of the services identified in the information provided by Dial Before You Dig. Measure out 1m from either side of the pits or pipes identified. This is the implied easement. 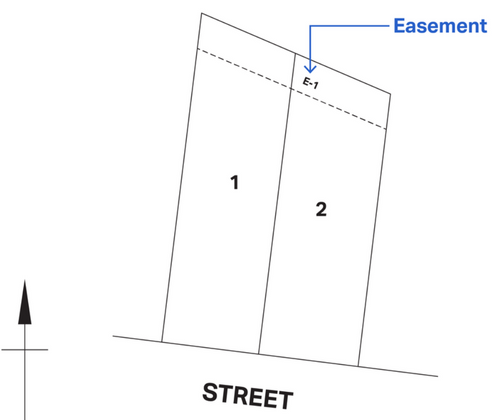 This is a cross-section of an implied easement. The easement runs above the pipe and 1m to either side. According to Section 148 of the Water Act 1989, implied easements are subject to the same access rights and building restrictions as easements registered on the title, so it’s important to know whether any exist on your property.